DEAR TIM: How can I remove brick mortar from the sidewalk I just constructed with paver bricks? My husband and I got the mortar smeared on the brick, and it looks terrible. What methods can I use so the brick is not damaged? DEAR SARAH: Smeared mortar on brick pavers, as well as brick walls, is a very common problem. It seems to be a growing problem as many masons don't seem to take pride in their work. It's understandable for DIYrs to make a mess. Depending upon the type of brick, the job can be simple or a nightmare. It's my hope that you don't have a deeply grooved wire-cut brick, as these have many small crevices that can make cleaning a career choice. CLICK HERE to get FREE & FAST BIDS from local bricklayers who specialize in repairs and mortar clean-up. Since you're concerned about the toxicity of different options, you may find it very hard to make a decision as to what chemical to use. You can use certain acids that are more aggressive than others, and the ones that work faster tend to be more toxic. But don't panic as you may discover that an aggressive acid treatment may work for you if you work to control the amount of liquid used as you work. In fact, I'd recommend you use the acid just below, but do so in a conservative manner. The acid will only harm you if you treat it with disrespect. Typically bricklayers will use muriatic acid to dissolve mortar from most brick. This is simply a form of hydrochloric acid. When you purchase this product it often has a skull and crossbones on the label. That's telling you it's a powerful chemical. But these products can be neutralized. That's something all of us should have discovered in our high-school chemistry class. The best part is the mortar does neutralize the acid as it works to dissolve the mortar paste. That's one of the benefits of choosing to use muriatic acid. As long as you don't go splashing it around and use too much, it's not that toxic. Plus, once diluted with water, it becomes even more safe. There are other acids that will react and dissolve the alkaline chemicals in the mortar. Even white vinegar that's in your kitchen will work to some degree. Since you eat vinegar in many foods, you know it's not a toxic acid. The challenge for you is finding an acid somewhere between vinegar and hydrochloric acid that will efficiently remove the mortar buildup. If you're really worried about the toxicity of muriatic acid, and you shouldn't be, you should consider calling a physical chemistry professor at a local college or high school. You can also visit a building supply company to see if they stock a non-toxic acid that will dissolve the mortar. The first step in the process is to remove as much of the mortar as possible with a scraper or chisel without scratching the brick face. Clear water flowing over the brick acts as an effective lubricant that will minimize damage to the brick. I've had great luck using a 3-inch-wide stiff scraper with a chiseled edge. This is an all-around great tool to have. It's wonderful to mix sanded or wall grout. Keep it clean to last for decades! CLICK THE IMAGE NOW TO ORDER ONE BEFORE THEY'RE ALL GONE! If you have to tap the scraper with a hammer, do so at a low angle with the face of the scraper nearly parallel with the face of the brick. You're trying to get the mortar film to a thickness less than that of a plastic credit card. Once the majority of the mortar is off the brick, you then should consider bathing the brick with a diluted acid solution. 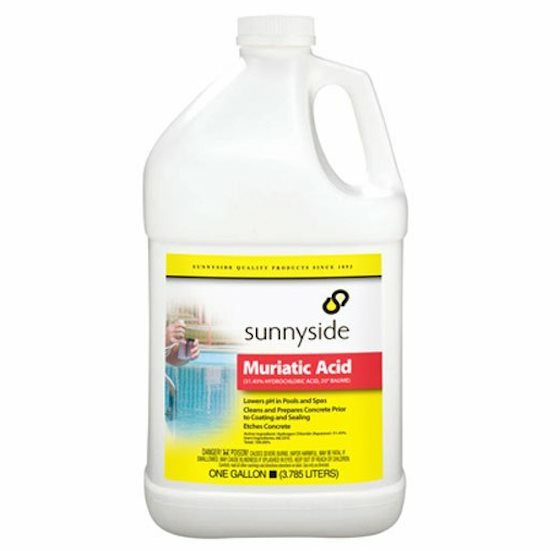 As mentioned before, muriatic acid is highly effective, and it works on most brick. However, you need to wet the brick before you apply the acid. See below. Usually you mix one part of the acid with ten parts of clean water. Always read the instructions on the acid label and pay particular attention to all safety instructions. IMPORTANT TIP: It's also a good idea to contact the manufacturer of the brick if you know who made it. Some brick can be damaged and discolored by acids. It's really worth the effort to call the brick manufacturer if possible. I've found in most cases you should dampen the brick with clear water before you apply the acid solution. Always try this in an out-of-the-way area if you're unsure if the acid will harm the brick. If you don't do this, it's possible to burn the brick. 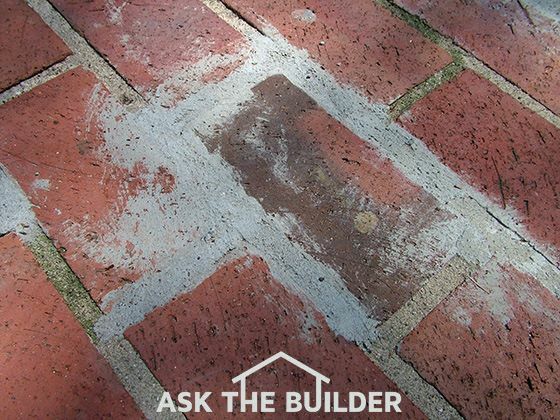 Some brick don't like muriatic acid and it can discolor them. Be sure to TEST the acid on the brick. Don't take a chance. If you use muriatic acid, you should see tiny bubbles forming where the solution contacts the smeared mortar. This tells you the acid is reacting with the mortar paste and is starting to dissolve it into the liquid solution. Use a scrub brush to help remove the mortar. Wait five, ten or more minutes after the acid solution has been applied to the brick before you scrub. The longer you allow the acid solution to work, the less you have to scrub. It can take multiple applications of acid solution to remove all of the mortar if the buildup is thick. Rinse the acid solution from the brick with lots of water. The more water you use, the better. Working with acid solutions is very tricky. You can hurt yourself, your clothes, your brick, the new mortar and vegetation around your home. If you have valuable vegetation and landscaping, you should try to stop any acid solution from getting into the soil. Plastic sheets work well for this purpose. Be sure to wear all of the protective gear to prevent burns to your skin and eyes. Muriatic acid straight from the bottle is a wicked liquid. The fumes are very toxic, and it can cause serious burns to your skin very quickly. Don't underestimate this chemical. I would not ever use muriatic acid on fresh mortar. Allow the mortar to cure a minimum of thirty days before you attempt to acid wash it. Each day the mortar gets stronger. Harsh acids will attack the fresh mortar between the brick that you do not want to remove. I, too, really like the vinegar idea. I've been all over the Internet looking for tips and you're the only one who offered this great idea. Probably because it is rather mild, but my mason has already taken off any of the heavy spots. I'm gonna try it out first thing tomorrow. Thanks! I have just bought my home, on the outside wall of the house there is about half an inch of cement on the wall that I am trying to remove. I have tried chiselling the cement and it I have lost part of the brick. The brick underneath is textured house brick. Could you advise on how to handle this. I'd have to see a photo of exactly what you're trying to attack. I was wondering if you had any recommendations on how to remove mortar dust from a slate stamped acid stained and sealed concrete patio. The patio was just installed 1 month ago and freshly sealed. Stone columns were built on this and there is some stubborn residual mortar dust left after multiple cleanings with soap and water. Any suggestions on how to remove this and get back that beautiful newly sealed finish? Can I just used vinegar? I believe my contractor used a solvent based sealer btw. You can try my Stain Solver if you want. If that doesn't work, try the vinegar but do it in a SMALL area with a cotton swab. Work in the shade. I have a mortar build fire pit that when poured, the gas pipe inlet (T-handle square hole) was covered up. The good news is the pipe stick out on the inside to hook up the gas line and pan. I was thinking of using a circle saw to reach the gas turn on/off from the outside but I do not want to damage the gas pipe of valve etc.